Here are some custom functions, af configurations and general settings I like to use when setting up my Canon 5D mark III camera. 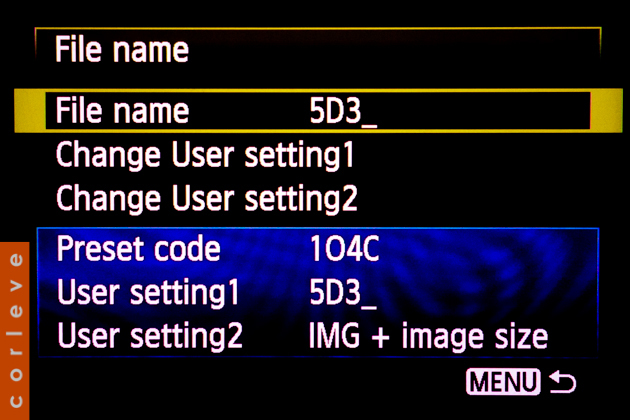 The 1DX shares a lot of DNA with the 5D3, therefore a lot of these options can also be found on the 1DX. Other Canon cameras may also have some of these features though they may be called something slightly different. These are very much personal preferences, there is no right or wrong but taking the time to explore these options allows you to think about how to configure your camera in the best way possible for your own personal situations, on the most part it will save you time and allows the camera to behave in a predictable manner. This is especially useful when using two or more cameras. In my case I have a 1DX and the 5D3 so I prefix all 5D3 files with ‘5D3’ and all 1DX files with ‘1DX’ so I instantly know which files came from which camera at a glance. I use the second option here so that images shot vertically are properly rotated on the computer but not in camera. This is because I prefer seeing as much of vertically shot images as possible in camera at a glance. 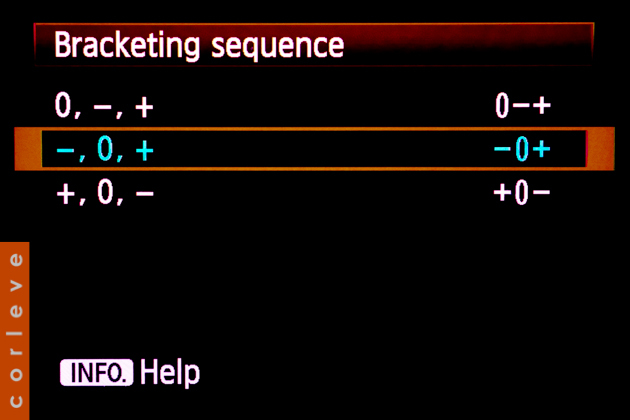 This is one of the huge benefits of an transmissive LCD focusing screen. Gone are the days when you had to buy a separate focusing screen with grid lines to help you perfectly line up and compose shots. 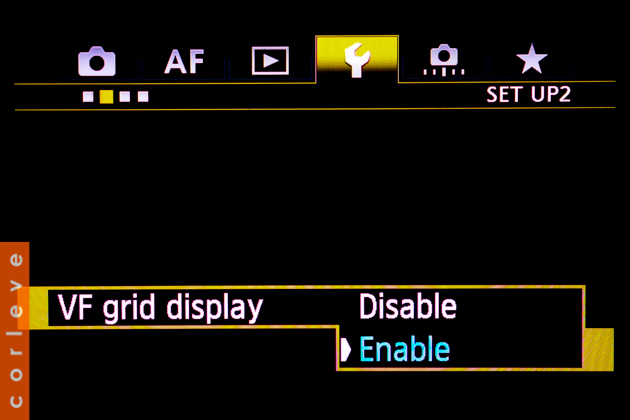 You can now enable a grid overlay in the viewfinder via this menu. Though I can see how rating images in-camera can be useful, I rarely use it and much prefer to use the ‘rate’ button to mark images as ‘protect’. I mostly use this for sport; after taking several bursts of images I’ll quickly review images I want to keep. I use the rate button to protect images I want to keep then later when there is a pause in the action, I go back and use the ‘Erase Images’ menu option to delete all images but it will not delete protected images. I find this workflow when shooting lots of bursts a quicker way to ‘chimp’ and keep the in-camera image count low so I don’t have a lot of images to edit later. Don’t forget to enter your copyright information, this will add your copyright info directly into JPGs and RAWs. Easiest way to do this is via Canon’s Utilities then sync it with the camera, otherwise it takes a while to use the scroll wheel to enter the information. This setting changes what the info button displays when the camera is in ‘idle’. Each time you press it you have the choice of displaying the screen options above. I reduce the number of options because I don’t want to be overloaded with redundant information, let me explain. I leave ‘Electronic Level’ unchecked because I rarely use it when NOT in live view mode, If you need to use the electronic level chances are you’ve got the camera on a tripod and in this case I find it easier to turn on live view to compose a shot. When in live view mode, you push the info button a few times and the electronic level appears regardless of this setting. 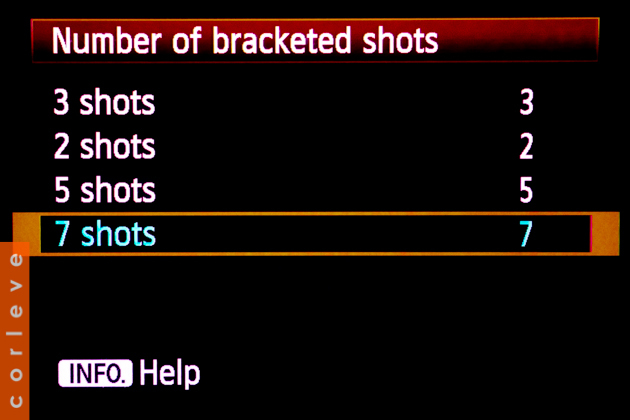 The next option, ‘Display shooting functions’ can actually be accessed directly by pressing the ‘Q’ button next to the wheel so this is just a double up of information. It might be immediately apparent that using an ‘Auto’ brightness control is good way to save battery. After several months of use I found that the auto brightness setting would throw me off a couple of times thinking my images were either darker or lighter than what they are. The purist would say to check the histogram, which I do if I’m in a studio but in situations where you’re on the go, checking histogram just won’t cut it and eyeballing the LCD is the quickest way to judge exposure. On a set brightness level at least you’ll get consistent results and I always leave mine on the brightest setting so that it can adapt to the brightest situation without having to constantly change the setting when going indoors. 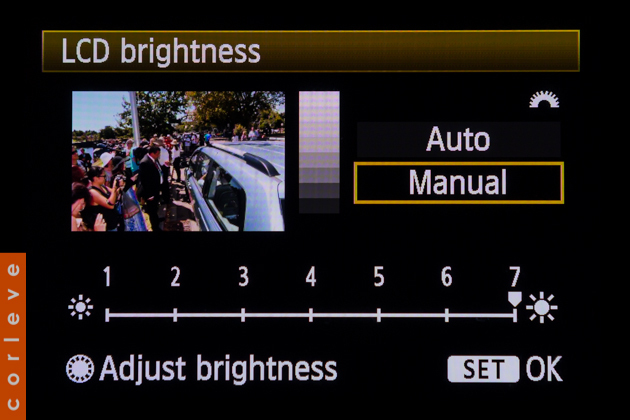 Setting a manual brightness level means you’re setting a known benchmark that you get used to over time, whereas with a variable setting that benchmark for judging decent exposure changes all the time. This is a nice touch by Canon. When you enable any of these settings you’ll see an exclamation mark (!) in the viewfinder as a gentle reminder that you may have enabled some of these ‘non-standard’ settings. 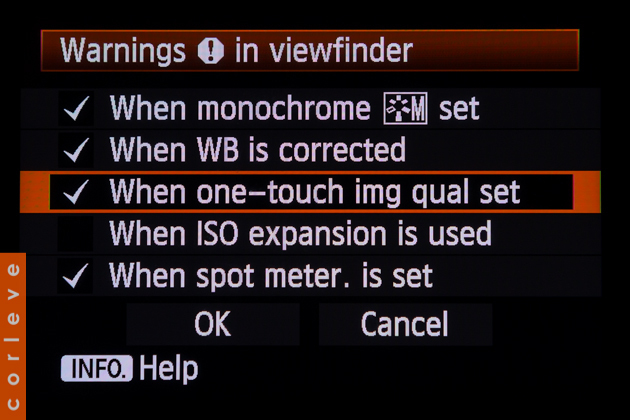 Other warnings such as ‘WB is corrected’ will appear on the bottom of the viewfinder as a ‘WB +/-‘ icon. 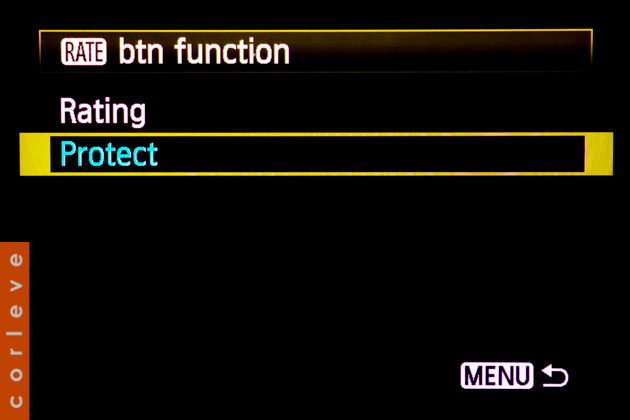 The WB warning is especially a good one as I do like to shift WB occasionally using the ‘WB Shift/Bkt’ menu option as I’ll explain later. 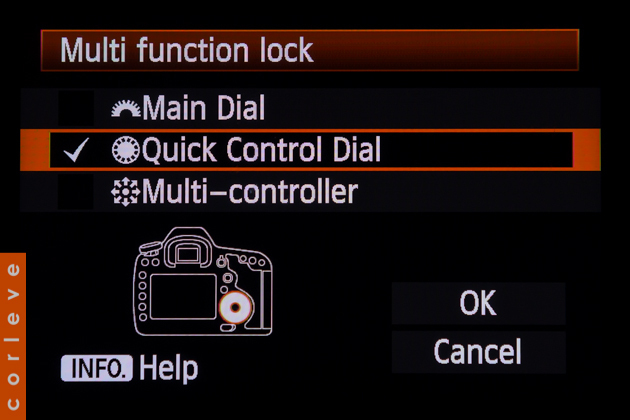 Canon has now extended the flexibility of what the lock button achieves, which is good. However the button/dial that is most prone to bumps is the main rotary dial so I enable this. In Manual mode, the rotary dial is used to control the aperture and in Av/Tv modes the dial is used to control the exposure compensation so it’s good to lock the dial down at times. The other buttons aren’t as prone to knocks and changing settings so I leave them unchecked, it’s also good to sill have some degree of control and the ability to switch AF points with the multi-controller. 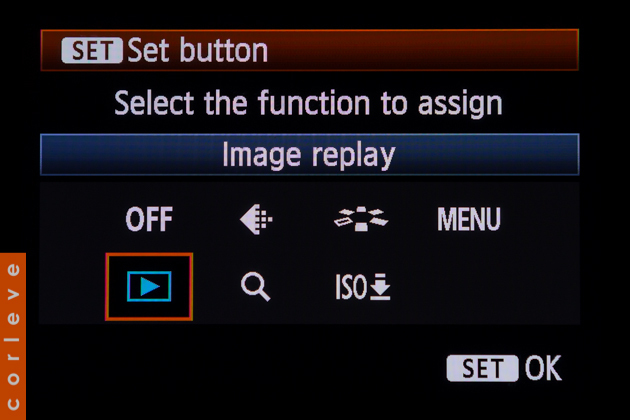 I like to use the SET button for image replay purely to keep my left hand fixed on the focus/zoom rings on the lens without having to move my left hand to the back of the camera to push the play button in order to review the image. This sounds rather dubious but in practice, especially if shooting say a tennis match or a situation that requires you to be attentive, you want to reduce the amount of time it takes to review the images shortly after so you can recompose yourself quickly to take the next shots. Yes, you can set the camera so it automatically replays the image after the capture but it won’t allow you to zoom into the image to check focus, etc. until you actually push the Playback button on the left side of the camera. Enabling this fuction allows you to capture your sequence, leave your left hand exactly where it is on the focus/zoom ring and simply move your right thumb over the SET button to replay the image as well as zoom in/out to check focus. While this is all happening if you see something about to happen around you, you can quickly switch back to taking the next shots quickly and you don’t have to brace the zoom/focus rings again. It’s basically a one-handed operation to review the images in detail. 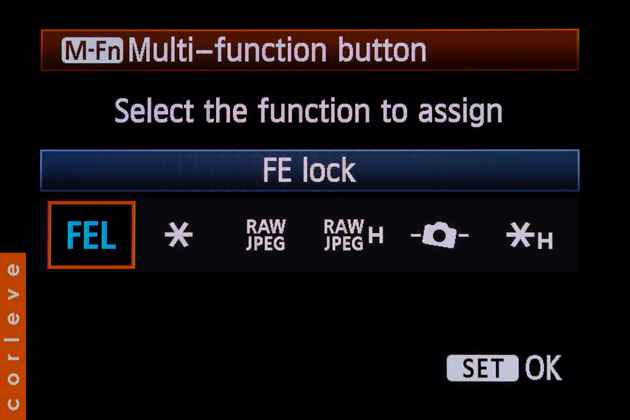 I use the Mf-n button which is that tiny button right next to the shutter release as the FEL (Flash exposure lock). If you don’t know, FEL allows you to get a more accurate flash reading before you fire the main flash. I use FEL all the time when taking photos of people. My technique is I first acquire focus on they eyes, then aim at their forehead to acquire an FEL reading then recompose for the final shot. I was taught this technique when I first entered into photography and it’s just stuck with me ever since for accurate reliable flash exposure for people’s faces. There are other situations you can also use this but maybe that’s for another blog post. 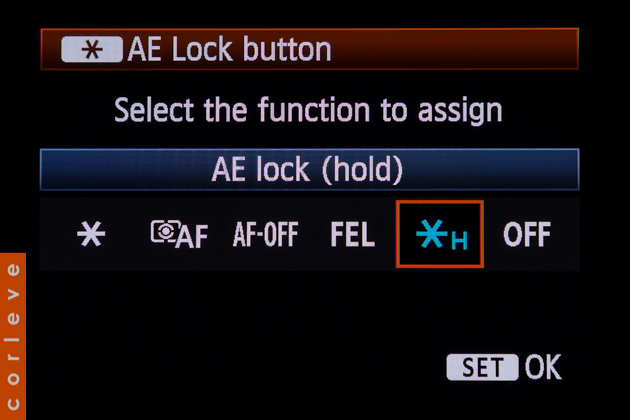 I set this as an AE (auto-exposure) lock button. This is mainly used in Av/Tv modes to lock or hold onto the metered exposure, allowing you to aquire and hold metering from one area of the scene then recompose the shot to take the picture. I use the combination of the above two configurations so that a half-press of the shutter only performs metering whilst auto-focus is performed strictly by the AF-ON button on the back of the camera, usually where your thumb is. Moving the auto-focus operation away from the shutter release button and assigning it to a separate button not only allows you to focus on one area, lock exposure from another area and recompose but also allows you to be creative in continuous focus modes. Another example when this configuration comes in handy is when shooting in conditions where focus lock is not always needed. If you know a subject is going to be exactly X distance away and they don’t move too much, you can simply use the shutter to take the images and in continuous shooting mode the camera will be faster because it doesn’t have to focus on the subject thereby maximising the continuous shooting speed. I rarely use the depth of field preview button for what it was built for. 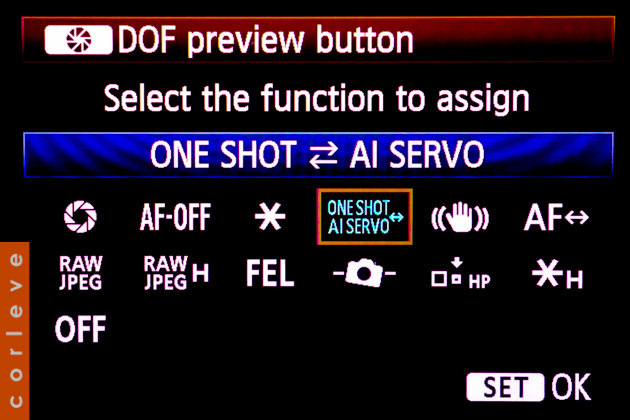 I configure the DOF preview button so it allows me to instantly switch between One-Shot and AI-Servo auto-focus modes. This has saved me many times, especially at weddings. 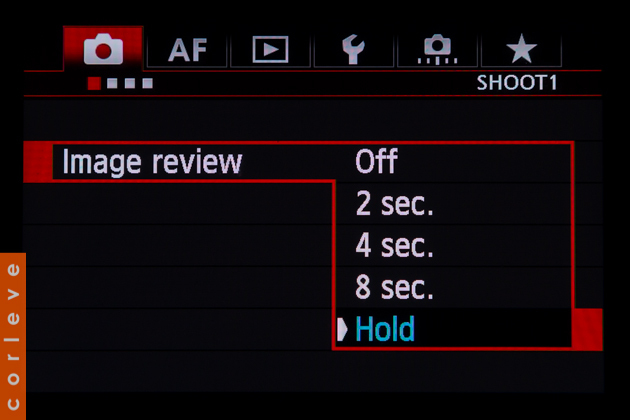 You no longer have to take your eye off the action to look at the camera and switch between auto-focus modes, you simply hold down the DOF preview button and AI-Servo mode automatically kicks in, then let go if you want to go back to One-Shot focus mode. Brilliant!! 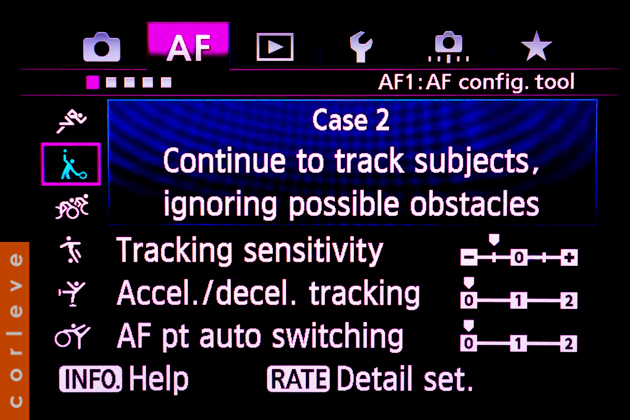 I covered this on my 5D mark II Custom Functions post here http://corleve.com/2010/5d-mark-ii-custom-functions, I enable this on every Canon camera where this feature is available. Very much a personal preference but I mostly use between 5 to 7 shots for HDR depending on the dynamic range of the scene. Having said this, on average, more shots will almost always give more smoother transitions and gradients within high contrast areas of images when HDR processing. 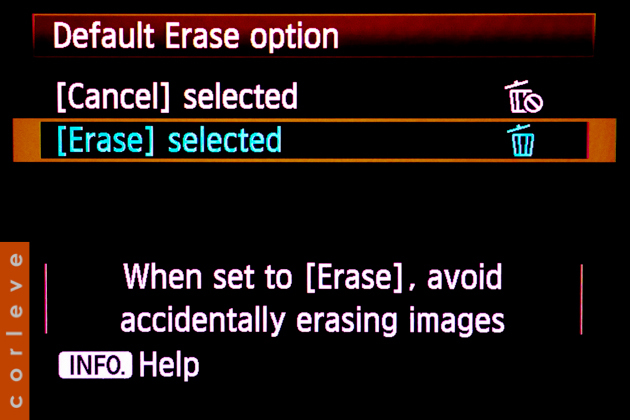 When deleting an individual image, by default the highlighted option is “Cancel”. To actually delete an image you have to move across to “Delete” and press Enter. In fleeting situations these are too many steps. By enabling this option it reduces the number of actions to delete an image to 2 actions; simply press the delete button then hit Enter. This has existed on many Canon cameras for many generations but it’s worth mentioning if you have not used it before. It’s simply a great way of collecting some of your most used options on a one-page menu so you don’t have to hunt around for your most commonly used options. You could set this up in-camera but the easiest way I find is to connect the camera to the PC and use Canon’s software, it’s a lot quicker and easier to find the menu options you want to assign to the ‘My Menu’ page. This changes how the camera behaves by favouring a faster shutter release with less lag or more processing time devoted to acquiring proper focus. Changing these options will come down to the kinds of situations you find yourself in. If you’re a paparazzi snapper, you’ll probably want to change the 1st image priority to be shutter release to ensure you get the shot, no matter how finely out of focus your shot may be. 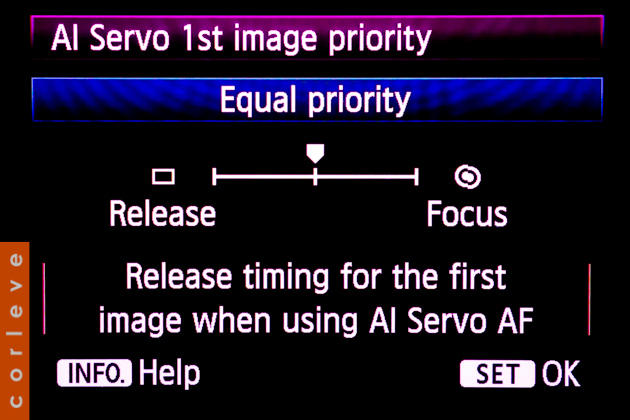 If time and a patient subject is on your side, you can balance the camera more toward taking better focused images – keep in mind these settings only affect AI-Servo mode, there is a separate setting you can use for One-Shot focus mode. In general situations however, I prefer to set my camera up so that the 1st image is balanced between quick release and acquiring focus whilst in subsequent images I prefer to have well focused images as opposed to a quick release as the camera is relatively quick anyway. 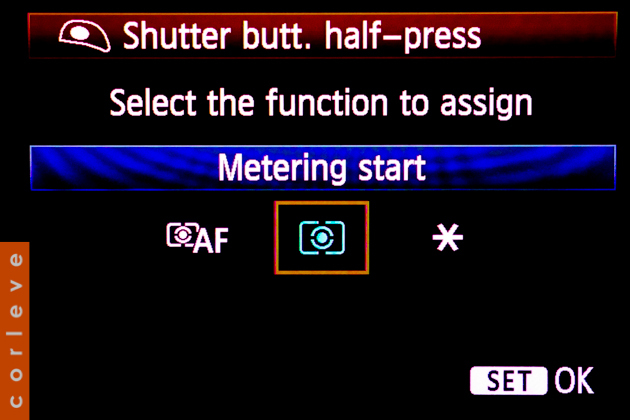 This option has been around on Canon for many years. I enable this option so that only the infra-red beam from external Canon flash units is emitted when trying to achieve focus, especially in dark environments. 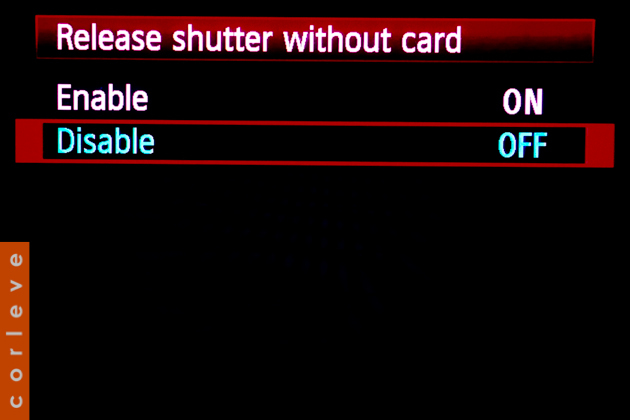 If you leave this option on ‘Enable’ and you are in dark conditions where the infra-red beam is still not enough for the camera to achieve focus, the flash will emit a series of stroboscopic flashes and it’s blindingly annoying – not a good way to treat guests but fine for inanimate objects. This will change depending on the kinds of subjects and environments you shoot in but generally I prefer well focused images instead of a faster shutter release as the focusing time of the camera is fairly fast anyway. If you are a paparazzi snapper, you probably want to select ‘Release’ as this will get you that all important shot without any lag whilst sacrificing some focus, but who cares when a slightly out of focus shot can still potentially earn you thousands right? When the camera comes across difficult situations to achieve focus such as opaque surfaces, dark lit subjects or shooting on or through glass, by default the camera will start to ‘hunt’ for focus. Should the camera begin to hunt it’s a sign that something isn’t right and you should change your technique in trying to achieve focus rather than praying that the camera will eventually catch onto something. For example, when shooting a human subject at low light and the camera starts endlessly hunting, your subject begins to grow tired of waiting for you to take a shot. 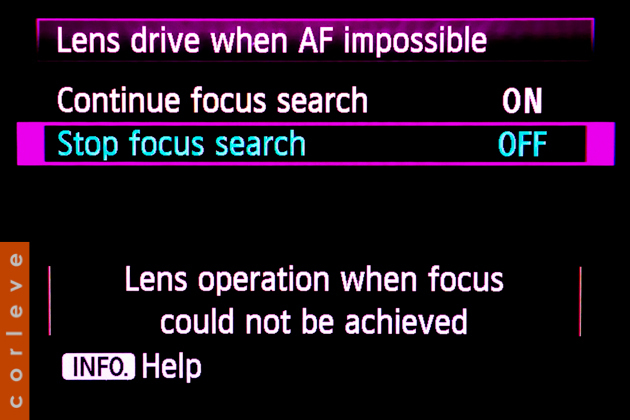 By changing this option to ‘Stop focus search’, the camera will first try to focus but if it can’t, it will stop focusing. Knowing that the camera can’t get focus means you can now quickly try a number of other techniques to try and achieve focus such as focusing on something else along the focal plane next to the subject then recomposing, among other things. 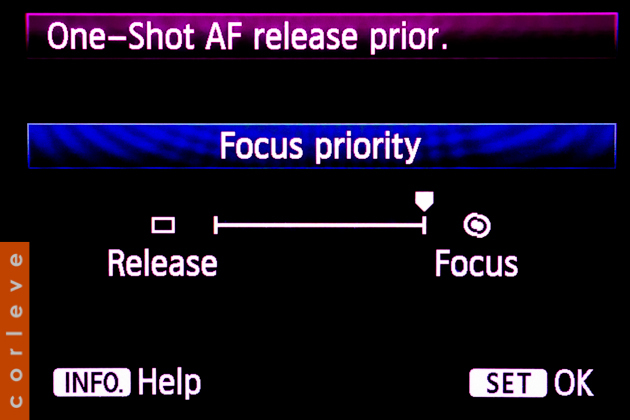 By not changing this option, should you let the camera continue to hunt for focus, it will be a long time before you realise you cannot actually get focus and it leaves your subject a little frustrated. 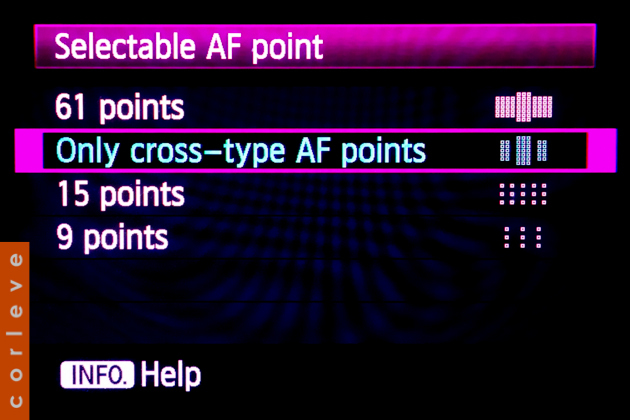 Canon have done an excellent job here of now allowing you to select only cross-type AF points to use for focusing. 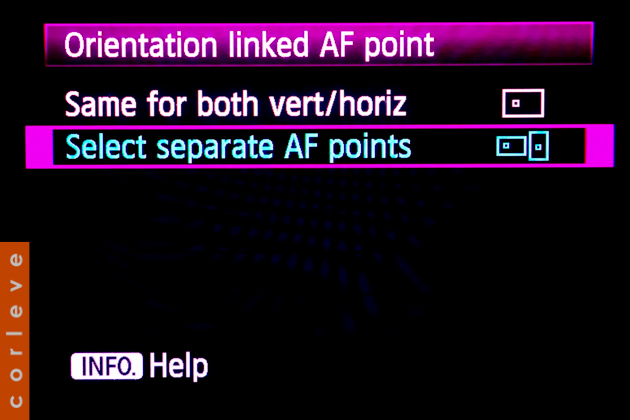 Cross-type AF points are a significantly more reliable type of focus point than the horizontal or vertical only sensitive AF points. It will help land focus quicker and easier because cross type points are sensitive to horizontal and vertical patterns on subjects. Focus points tend to look for edges in patterns as they usually have some contrast that helps achieve focus. I prefer using the main dial to switch between AF methods. 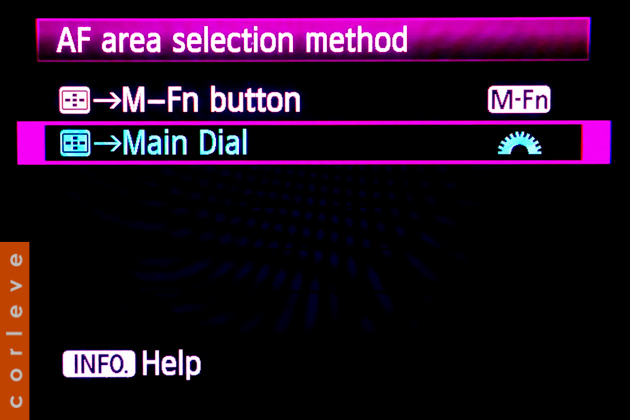 When using the main dial, as you cycle through AF methods and go too fast past an option you can easily dial backward whereas using the single Mf-n button means you have to keep cycling through until you land back at the selection method you missed. This is an awesome feature! I first saw this feature on the Canon 1D mark IV. 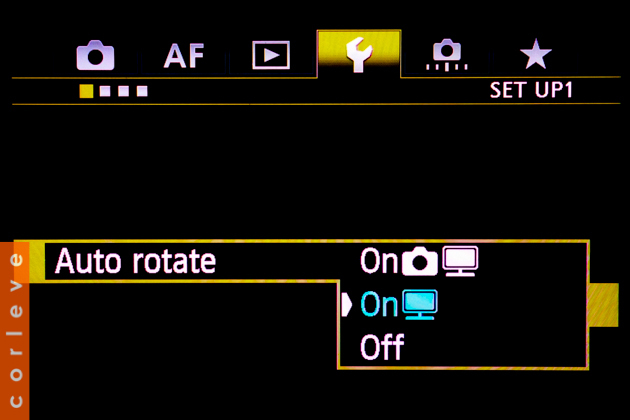 This feature enables the camera to remember which AF point you selected in either horizontal or vertical held camera positions. I like to use this at fashion catwalk shows where usually I’d pick the top-most AF point for models when the camera is held vertically but use the left-most or right-most AF point for focusing on guests when the camera is held horizontally. I capture the model as they walk down the catwalk then once they turn I can quickly switch to a horizontal position to catch guests’ reactions instead of fiddling with AF points or focus-recomposing. Many more uses for this feature but this is just one example of how I like to use it. Say you’re at the left most edge of the AF point grid and you quickly need to get over to the right-most AF point, by having this enabled, instead of moving the joystick many times to the right, you only need to move it to the left and the AF point selection will move across to the other side of the screen. 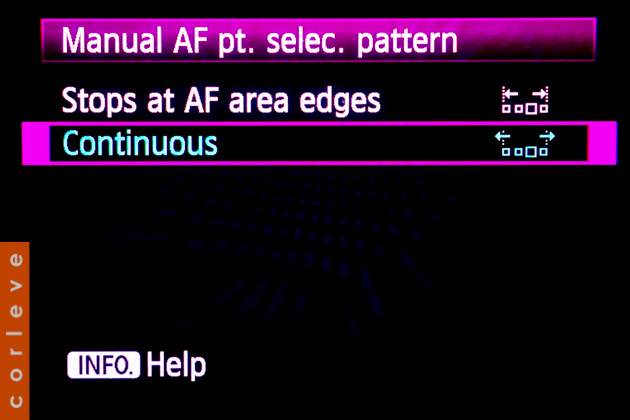 Having this option enabled makes it very fast if you tend to use the outer most AF points of the AF grid and switch between the extreme edges a lot. You can press down on the middle of the joystick to return to the center AF point at any time. 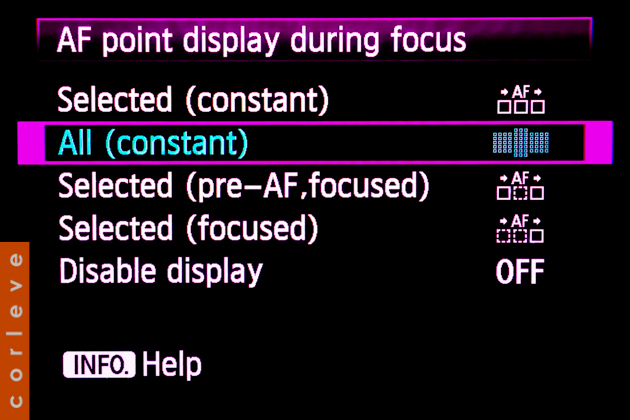 This changes when AF points are made visible during the auto-focus operation. I like to view all AF points at all times so I know where potentially useful AF points are landing on the subject. It not only quickly helps frame subjects but can also help in immediately determining which AF point is the best to use for a particular situation then switch to that AF point. I prefer having the viewfinder display illuminated at all times. 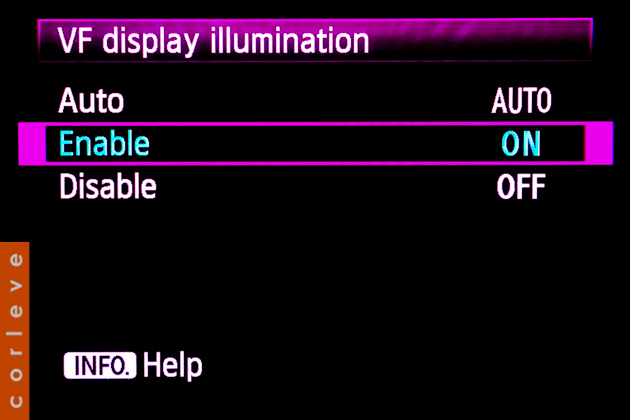 On ‘Auto’ the camera will know if it’s a dark environment and will automatically turn on illumination. However, I have found even when shooting during the day or in bright conditions, if you have an AF point trained on dark/black objects, you actually can’t make out the AF point properly so having this illumination on all the time allows you to still see it. 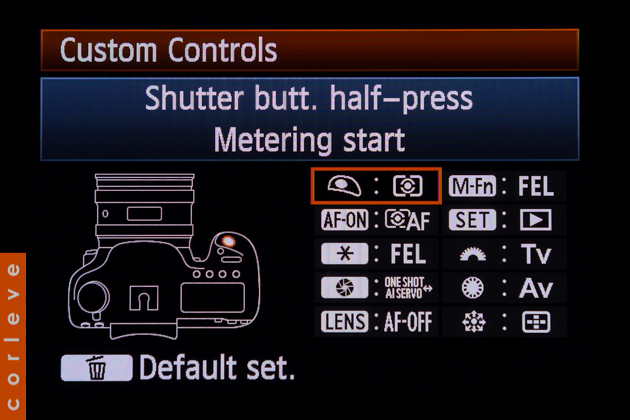 If you’ve ever used Canon’s 1D cameras prior to the 1DX you will greatly appreciate this newly designed AF menu. This menu only applies when using AI-Servo. 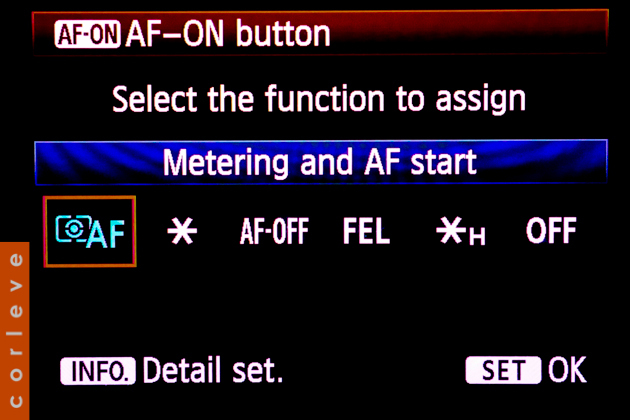 Canon have done a fantastic job here of simplifying the configuration of the AF system. I won’t go into detail of what each case does and what each sub-option does but all I’ll say is for general shooting, I prefer using Case 2. 90% of the time, I prefer tracking a subject without letting obstacles between myself and the subject get in the way and the sensitivity of this is mainly dictated by the ‘Tracking sensitivity’ sub-option. 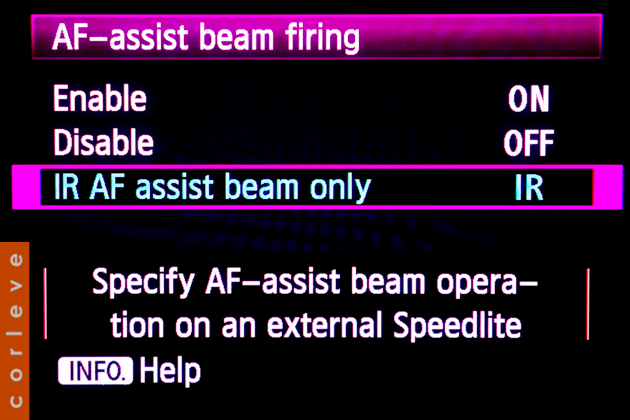 Other options like ‘Accel./decel tracking’ and ‘AF pt auto switching’ are options I then fine tune depending on the situation but on the most part, Case 2 is my favourite for most situations. Note: This material is not mine. It is owned and copyright by Canon Inc. The beep that’s referred to here is the focus confirmation beep that sounds whenever you’ve achieved focus on a subject. It might be reassuring to hear but when you already have a focus confirmation indicator in the viewfinder, it’s just a double-up of information. Not to mention, it annoys guests at weddings and quiet gatherings. Turn it off. Ever been in a situation when you start taking images, everything is cocher only to realise you haven’t inserted a memory card and you only just saw the warning on the back of the camera at the end of a shoot? Well that’s where this feature comes in. 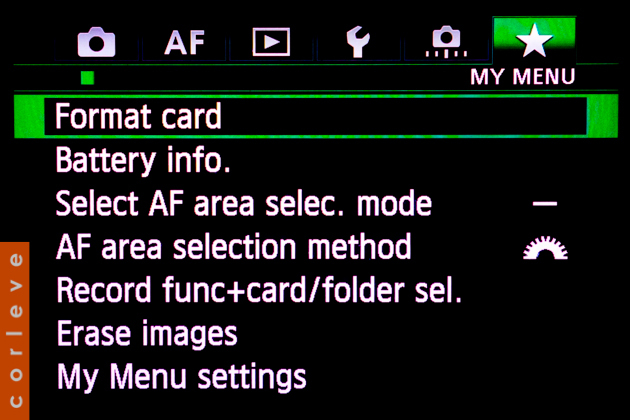 When enabled the camera will not let you take an image unless a memory card is inserted – this will save you some day. By choosing ‘Hold’, after you take a photo the image will stay on screen until you press any button. I find this more useful than than having the image disappear after a limited time, it means you don’t have to press additional buttons incase you need to review the image for a longer time and it’s not that much hit on battery especially if you have a battery grip. This is great to have enabled, it will remove any lens distortions and chroma aberrations from images but two things to note; it only works on JPG images and will only work with Canon lenses. If you shoot RAW, most good photo editing programs such as Lightroom do their own automatic lens corrections including non-canon lenses. 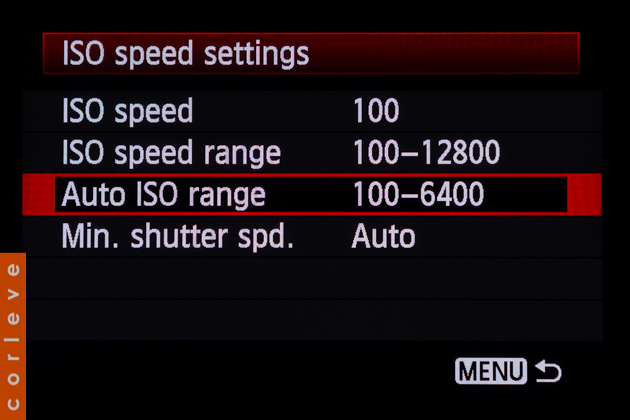 This sets a limit on what ISO speed settings are automatically selected by the camera if you use ‘Auto ISO’. I personally like to limit the camera to 6400 at the high end but it’s not because anything more than 6400 on the 5D3 is obscene, infact I have shot ISO 10,000 for night spots at times. I limit the camera’s choice in Auto ISO range because from my experience the camera is very eager to go upto the next ISO level when it really doesn’t need to. 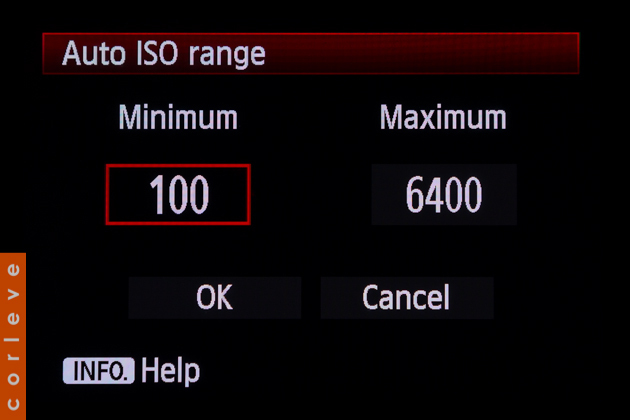 It’s almost as though it needs an ISO compensation dial to tell the camera “Whoa! Step it down a little” before they implement the Auto ISO feature. 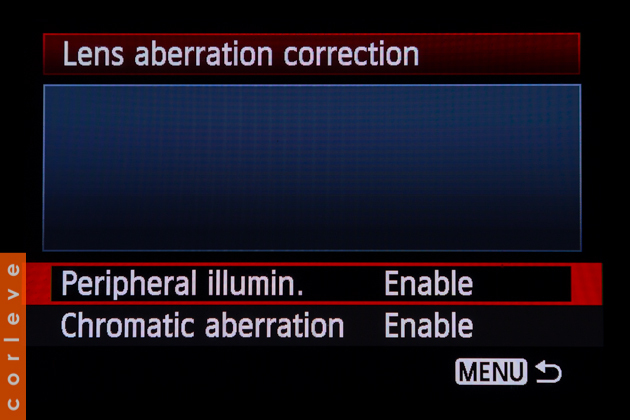 Another helpful feature from Canon, this only takes effect in Av and P modes. 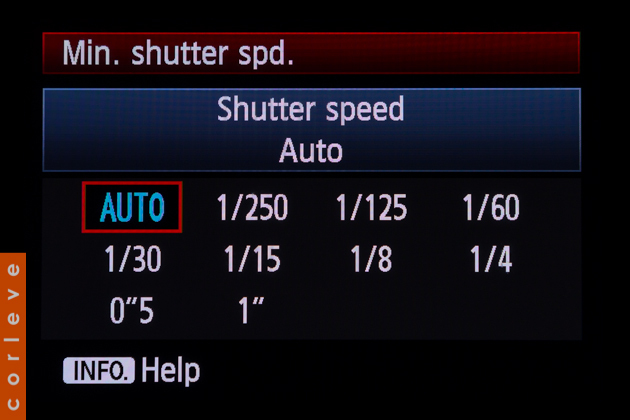 You can preset a minimum shutter speed but I find it more useful to set this to ‘Auto’. Because the camera knows what lens you have attached and what focal length you’re currently using, it automatically knows not to go below the focal length’s ‘reciprocal shutter speed rule’, it even works on zoom lenses. So say if you’re shooting at 28mm and the shutter speed is approaching below 1/30, instead of plunging futher below 1/30 to say 1/10, the camera will maintain the shutter at 1/30 but automatically increase the ISO. Very cool! Again, if you’re shooting at 200mm focal length and the shutter starts going down approaching 1/200, the camera will begin to increase the ISO instead of letting the shutter speed dip below 1/200. There’s a reason why this is and it all comes back to the ‘reciprocal shutter speed rule’ which is very handy to know and in a way, the camera is saving you some time and thinking space in selecting the right shutter should it drop below hand holding ability to avoid shaky images. This will be a controversial decision. Unless you’re working with high-end calibrated monitors and delivering images to clients that use high end calibrated printers or viewing on high-end calibrated equipment, save yourself the heartache and go with sRGB. This will open a can of worms for sure but there is a common misconception that shooting AdobeRGB will automatically grant you the largest colour gammut and best editing possibilities. Well yes, it does but you also have to have a monitor that can actually view 100% of the AdobeRGB gammut. Even if you do have a monitor that can view 100% AdobeRGB, you have to think about your clients and how they will use the images. If the images simply end up being used on a website (which for me is 90% of the time), the majority of the world’s monitors still only view ~ 72% of sRGB. In addition to this you’d better hope they use either Safari or Firefox because they are the only browsers that can read embedded colour profiles. There is so much going on on this mix that you have to think of the target client, what their use is and the lowest common denominator. If the image is for the masses and will most likely be viewed on monitors all over the world, sRGB is your best bet to render images to your intent without any outside colours being lost or incorrectly translated to a lower colour space. Do not underestimate the power of creating your own picture styles, it will shave hours off your editing workflow especially when shooting JPEG and give you better results when shooting video. Creating and uploading picture styles can be done via Canon’s own picture style software that comes with the camera. Using the software you can tweak a lot of variables such as curves, hues, luminescence, tone, etc. For example, I know with fashion catwalk I prefer to shift certain narrow hues to achieve good skin tones. This would probably suit editorial/agency photographers where you need to turn around images very quickly with minimal to zero editing. The CineStyle picturestyle can be downloaded free from the Technicolor website and is a must if you’re shooting video – it’s a very flat contrast and neutral colour style suited for post production video editing. It has been a long time since I originally wrote this post and I’ve had a few emails with questions as well as requesting more content on other topics. Tell me what interests you, fill out the survey below or let me know in the comments. Thank you so much for an excellent summary of these custom functions. I’ve just bought a 5DMkiii and this was exactly what I was looking for. Would you be willing to share your Fashion picture style with me? Sure, send us an email via our contact page and I’ll send you some info. thank you very much for your infromations.according to me it is very useful.i have a mark 3 just few days ago.would you be willing to give your portrait picture profile to me. Thanks, hope it’s been useful. The ‘Portrait’ picture profile is just the standard built-in profile accessed via the Picture Styles menu. If you use Picture Style Editor you can tweak any of these profiles or create your own. Thank you so much for this tutorial! So much more helpful than anything else I have seen online!! The 5D Mark III has so many functions it’s easy to get lost in them! A real difference from the 40D I had. Are you willing to share your Fashion and Tennis Day settings? It would be so appreciated!!! Sure, send us an email and I’ll forward you the details. Keep in mind however, the picture styles I use are only suitable to the conditions I shoot in. The fashion picture style I created is specifically for catwalk fashion shot under 2800k lights and shits skin tones from green/yellow to a natual pink colour. The tennis picture style is for the harsh australian sun shot during the day and shifts the blue hues for the Australian Open banners. It’s probably best to create your own picture styles suited to your own shooting conditions and it’s fairly easy to do. I Would love to see how to do runway picture styles. I shoot at 3200 kelvin and that would be very helpful with all the different colored gels.Thank you! Very helpful. Thanks, will be sending you an email!!! Wonderful. Thank you for taking the time to post – so many useful tips here. If you have a spare moment – would you be so kind to email me your cool fashion and tennis day settings and any other you have please? I have just purchased the 5DM3 too. Tks so much for the info on settings. Much appreciate your time and effort in posting. No problem John, it’s a great camera, enjoy! been a canon shooter my entire career….LOVE! Recently i have been having issues with “file quality” right out of the camera shooting JPEG only when open in PS i see the images size is 53 inches wide by 80 inches hi resolution is 72. I was confident i had the file setting to L FINE but maybe i am wrong..what i know is that i am getting images that look like crap when enlarged to 16×24 at 300………..when i look at some past images in PS they are 14 inches by 9 inches and the resolution is 300…….so i have something out of whack on my camera baby? No or YES bobbi you are an idiot or suggestions as to what i have done? Hi Bobbi, because the camera doesn’t have a DPI setting as such and you are already shooting at the highest resolution JPG (JPG, Fine, L) then I can only assume it’s something with your software. In LR there is a setting under preferences that sets the default DPI for when externally editing a file in PS or other programs, by default it’s usually 240 and I usually set this to 300. 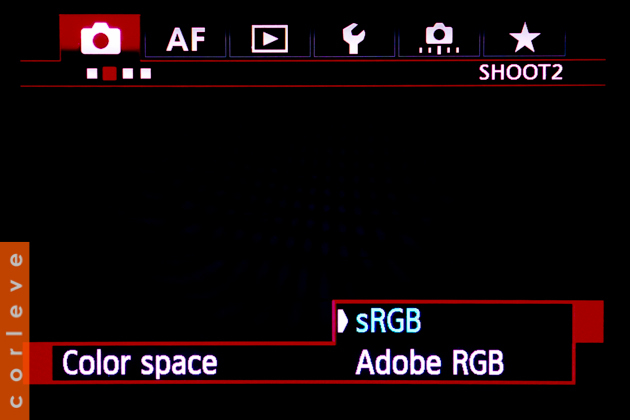 In PS, if you are directly opening the JPG then I don’t have an answer but if you’re opening the JPG as a DNG which may bring up the ACR (Adobe Camera Raw) converter, check the setting at the bottom of the panel which also has a default setting for DPI, colour space, etc. Really appreciate you on sharing this functions in details. Just want to request you can you also share your Custom setting C1 C2 C3. I have just bought 5DM3 this week. Would be good to setup this to make life easy. Hi, the custom presets are for picture styles, not the preset modes (C1,C2,C3). Did you want the picture styles? Do they apply to JPEG only ? Not raw? 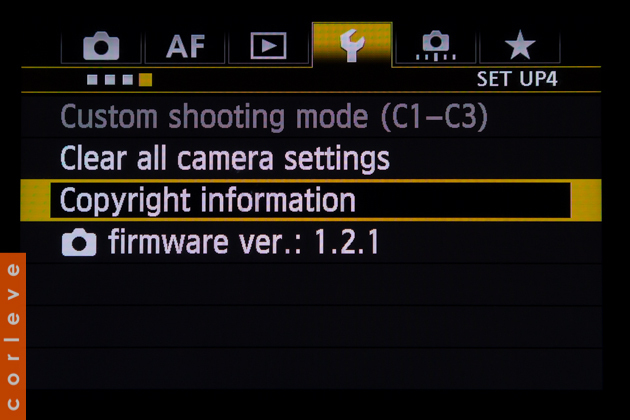 Do you mean custom settings as in C1,C2,C3 or custom picture style settings? Custom picture styles (or any picture style) is mostly to do with JPGs. The RAW file has a very small version of the JPG embeded in it with the picture style applied but it’s only used as a very small image preview and will almost immediately be overtaken by the RAW converter’s rendering (eg. Lightroom) and whatever develop presets you may have applied in the program. I’m a photojournalist and just upgraded to the 5D III bodies. Thank you very much for your informed and useful information! It saved me hours of work and trial and error and, frankly, I would have missed several of these settings. Big ups! I just recieved my MKiii an hour ago, the information you have shared above is awesome and very detailed. Thank you for making the task of moving from a 7D to the 5D MKiii so much easier. I am going to use this info tonight. Hi Mark i read your tutorial curiously,i felt it awesome.its very helpful to me.but still i am confused on one feature embeded in 5d3 that ‘custom shooting mode c1,c2,c3.Unfortunatly you didn’t enter that segment.If you do the same,it will very helpful to me and many others like me.Please help me that how to set it. Thanks for the suggestion Jayakish. I might add those when I get some time but C1,C2 and C3 are simply handy preset modes you can create and assign to those modes yourself. Eg. in C1 you might want to set it as ‘(M)anual mode, ISO 3200, WB Shift, etc.’ and C2 you might want to set it as ‘(A)perture priority, ISO 100, Neutral picture style, etc.’. The ‘C’ modes are just there to make it easy to setup your camera so if you regularly use a certain combination of settings, say in a studio, you can walk straight into your shoot, flip it over to a preset mode and fire away. Great info – Really appreciate it and will be trying out the Cinestyle profile on my next wedding Video. Thanks, glad it helped. 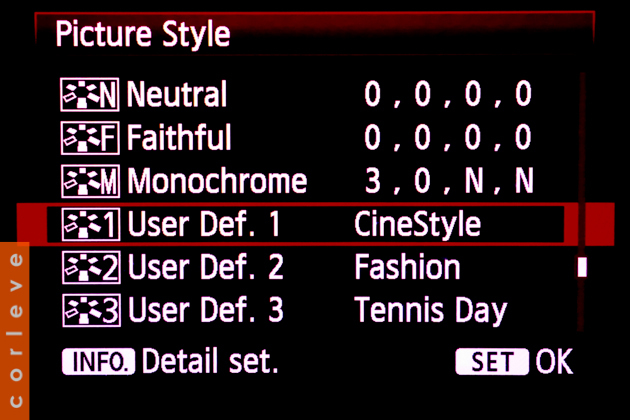 Don’t forget you can also use Canon’s picture style editor to create your own picture styles too – this is pretty much how the Cinestyle was created. The best information and settings for Canon 5D3. I will spread your blog to my friends. Thank you for sharing. Awesome, thanks for the great feedback. Thanks Kit, glad it helped! Why do I do this? Because I live dangerously…and I was bored at the time. Great Site and Images Sheer Inspiration!! I’ve hired the 5dmk3 and was looking at purchasing one maybe next week. I have taken some test shots and taken them into Camera Raw to look at. Strangely the default settings are set to Zero? Im using Camera Raw 8.3 for CS6. I shot in Neutral. The blacks slider is at +72, highlights -32, the vibrance is set at +58, the Sharpening tab defaults to +78 instead of +25 it also boosts the Luminance? In the tone curve tab the shadows are down -26. These all should default to zero apart for the sharpen which is 25. I’ve reset the camera settings and it still does this. When I return the sharpening to 25 and zero the photos look like they have had noise reduction and are soft. I have the noise reduction off in camera too. Im now not sure if i should get this camera? or is this just a bad hired model? Another way to test whether it’s lightroom causing the issue or the camera is to NOT use lightroom but use DPP when you first copy the images to the hard drive. Don’t use LR to open or import but go straight to Canon’s DPP (Digital Photo Professional) software and have a look at them there. If you are still seeing weird results, check the picture styles menu on the camera, set it to Standard and go to the standard profile and ensure all sub-settings are set to default. If it’s a hired or borrowed camera the best thing to always do is clear the custom functions and reset the camera to defaults as you might have someone else’s settings and copyright info embedded in the files you produce. Due to a Nikon to Canon change just this week, your information has been a great help with set ups and understanding of the functions. Great writing and Pictures. Thank you and keep up the great work. Hello many thanks for your wonderful information. I actually leant much more in a few minutes than reading a few pages of the manual. I also shoot fashion photography and have changed a few setting which would make me an even better photographer. I would very much like the cine-style and fashion style if its not too much trouble. Many thanks again for a very happy Canon Photographer. Hey Norman, I’d be happy to share my custom Canon Picture Styles but please be aware as I mentioned earlier, these picture styles are very customized to the environment I shoot in so when I’m shifting hues on certain colours alike, while it may suit me it will probably produce an entirely different result for you because of slight changes in white balance and exposures. Great advice, really useful. Thanks for sharing. Thanks Garry, glad it helped! Hi.recently I had a fashion shoot with two cameras mainly canon mark ii and mark ii I would like to share the files where in there is a difference between the output result. While one shows perfect colour balance while the other gets burn. Pls guide me. Pls send your e mail I’d so that I can send you the photos. Hi Nikhilesh, differences in output from different cameras can usually be resolved in using a colour patch system. Feel free to contact me if you want to go through it. Great information, I am upgrading my 70D to the 5DMIII and although many of the setting are the same it is much easier to go through the list and see what I need and make the changes immediately. Glad it helped Chris, thanks. i’am not so satisfied with the colours of my 5d mark iii. i owned a canon mark i and they are really amazing. i try to make the colours as they are in 5d mark i and nothing i have tried with the picture style. Which colour space are you running? How are you assessing the colours (eg. what screen, is it calibrated, what is the colour space of the screen and camera, what program are you using to render) ? Hello my friend! Thanks a million for the tips. I truly appreciate your kindness. I just upgraded from 70D to 5D Mark 111. I am trying to learn the camera but I am tempted to return it. The color in standard mode is horrible. Any suggestions? Can you be more descriptive when you say the color in standard mode is horrible? What is horrible about it? What are you comparing it with? What program are you using to render the images? What colour space are you shooting in? Thanks! 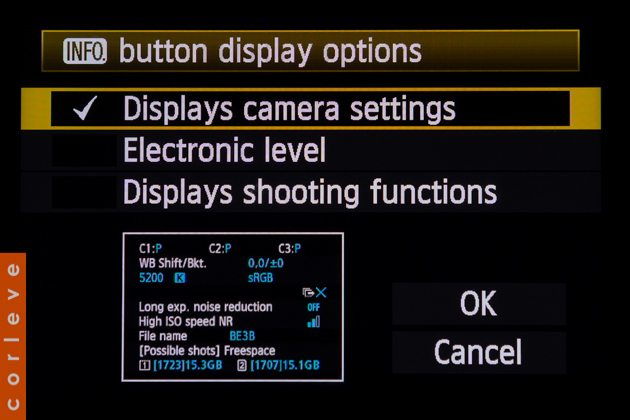 Separate settings for 1DX – there are a couple of operational settings that make the 1DX better, FEL linked to AF point for starters. I will write a separate blog post on this very soon when I have time. With regards to AF configuration – have you had a look at Canon’s own AF guide published with the 1DX? I’ve provided a link to it in this post and the sports you mentioned are covered specifically in that guide. Let me know if you get stuck and perhaps I’ll share some of my settings. Great post! Very helpful and I wish I’d read this when I first bought my camera! Really enjoyed this lesson on the MkIII. Have only just bought but one question. I dont have an EF lens at the moment so just so i could have a play, i attached an EF-S lens but noticed the 41 AF points is not showing, just the centre column. Would this be due to the lens Im using?? First – be careful when using EF-S lenses on a full frame body. The EF-S lens design caters for a protruded rear lens element casing which when used on a full-frame body, can cause the mirror to slap onto the rear lens element casing. Some EF-S lenses don’t protrude as much in which case you may be able to get by with using an EF-S lens on an EF (full frame) body. Second – The way the 5D3, 1DX and 7D displays points are quite smart, it knows which lens you are using and only shows the applicable focus points available for the lens. Usually when using slower than F2.8 lenses (F3.5, F4 and greater) these cameras will reduce the number of AF points available to pick from. 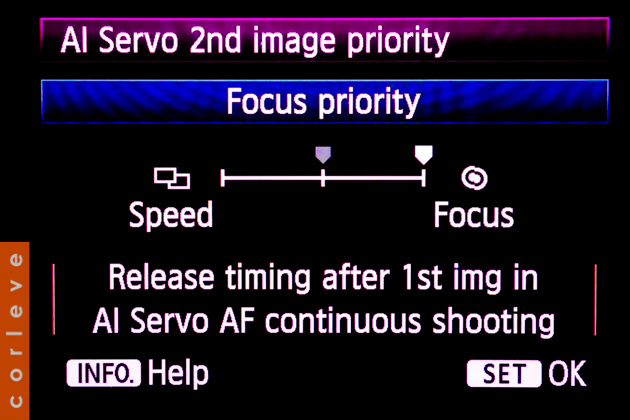 Some points demand that you use faster lenses (F2.8 and lower) and therefore will activate additional or all available AF points on these cameras. So to answer your question, the camera is doing what it’s supposed to. Correct, the later model Canon cameras now automatically show only the focus points that are applicable to the lens attached. Very cool feature! Please, could you help me with your picture style. i m still struggle to get the right one. What are you struggling with exactly? Send me a sample and I’ll take a look. What are your settings? 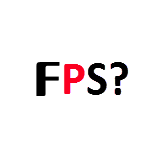 Can you post an image? Very useful information. Thanks a lot. Can you share the information if you have more? Appreciate it. I have Canon 5d Mark 3 as well. I just bought the 5DM3, previously owned a 7D. Since I shoot in RAW most of the time, and use Lightroom6, I would like to duplicate or close, to what was displayed on the camera’s back when I import my shots to LR. Apparently, LR displays the shots way different on what I see in my camera. Do you have an import presets that will closely match Canons? thank you. I think the JPG rendering are different between them but it would be nice if I can match them close. Thank you. Andy, the image that is display on the back of your Canon camera regardless shooting raw or JPEG is a result of the image + in-camera post processing (picture style). When shooting JPEG, this will ‘stick’, when shooting RAW, that image is embedded as a smaller thumb inside the RAW file but your RAW image processor (Lightroom, Capture One, etc.) will then takeover during import and apply it’s own picture settings on import. When using Lightroom, to mimic the picture that closely resembles what you saw on the back of your camera, in Develop mode, on the right hand side scroll all the way down to Camera Calibration and change it from “Adobe” to “Camera Standard” or whatever the name of the Canon picture style you used. Usually reds and blues are affected the most. Alternatively, Canon’s DPP will give you an exact 1:1 match with the camera. Thank you so much for these custom functions. Would you be willing to share some wedding picture style with me? No wonder people are still viewing this article and leaving great comments. This is such a great help!!! Is it possible to get your fashion show settings? and did you produce one for the cinematic look for stills (16×9 setup)? if so, I would love to see what you have done compared to my settings. I have looked and looked but cannot find the Min Shutter Speed option in the menus option – can you help? This article is the best I have seen anywhere thanks. Thanks Roger! 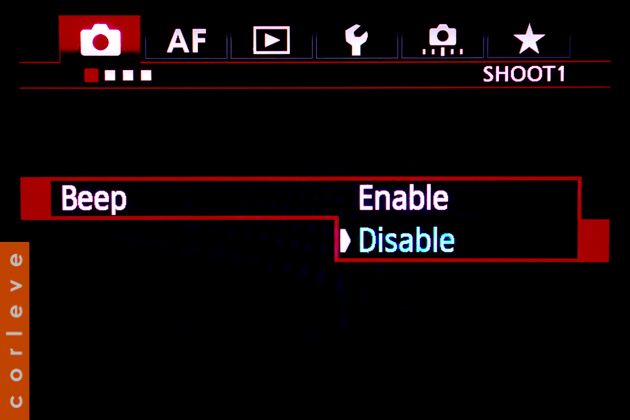 On a 5D mark III, this option should be on the second red shooting menu tab. Reply back if you still need help. Hey Nabz, choosing the right shutter speed comes down to what focal length you’re shooting at and (obviously) how fast your model is walking but assuming you’re shooting between 50mm – 70mm, I would usually go with a speed anywhere between 1/125 – 1/250 depending on the model’s movement. Thanks for this article. I was looking for inspiration to set up my canon camera and I sure found it. I also voted for an tutorial on LR workflow. Looking very much forward to get some new tips in that department. myson was playing with my canon 1dx and clear my setting. now my lens wont focus i tried using my other len still the auto focus not working need help. Google AdSense is an advertising service provided by Google. www.corleve.com uses the “Doubleclick” Cookie, which tracks use of www.corleve.com and user behavior concerning ads, products and the services we offer. You may decide to disable all the Doubleclick Cookies by clicking on: this link .